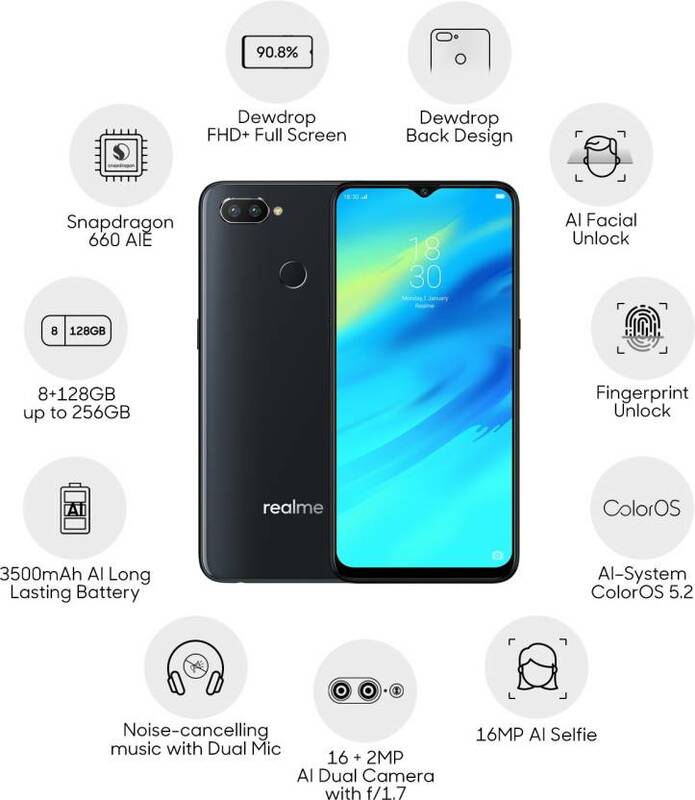 Realme came to India in May 2018 and launched the Realme 1 with great specs and low pricing. After that Mr. Madhav Seth, the Chief Executive Officer of Realme, did the perfect research on what Indian smartphone consumers want in their phones. And the answer was quite clear, performance with decent price. Thus Realme got the key and focused on public's demand. They launched the Realme 2 Pro recently and it was the perfect phone for maximum Indians, with sd660 and the dewdrop notch. This is the cheapest phone to come with those features. Now, does the phone matches the quality a smartphone needs nowadays or it's just a hype that we should ignore? We will be discussing 7 drawbacks of the phone and compare with pros of the phone to find out if the pros are enough to compromise with them or not. Nowadays most of the phones are coming with metallic or glass build in that price range to provide durability and looks. But Realme 2 Pro here has a polycarbonate back, obviously just for the cost-cutting purpose. But they didn't keep it limited and added a glass-like finish to give the good looks and ensure that consumers don't have any complaint with the looks though having a plastic body. With this, those consumers who prefer looks over durability they will be extremely satisfied to have such a device with these kind of features in this price bracket. Another drawback of the phone lies in the most important feature of any smartphone which is the display. We mostly use the display of the phone to deal with any of the activities a smartphone can do. In the budget segment, most of the smartphones nowadays are coming with the IPS LCD display. We can also see the super AMOLED displays from brands like Samsung in less pricing. But Realme 2 Pro here comes with a LTPS TFT display in it. The display obviously looks pretty good and punchy despite having that type of technology, but the TFT displays are very aggressive to consume the battery. The display stands between TFT and IPS LCD and can be considered to be good after looking at the processor and pricing. Dual cameras has been a new trend of 2018. This is not just limited to high end phones now, but mid-range and some budget phones also has the dual cameras nowadays. In the mid-range segment, where the Realme 2 Pro stands, most of the phones have the 5 MP secondary camera to provide quality depth effect and good pictures with the rear camera setup. But Realme 2 Pro here comes with a 2 MP depth sensor in it, which also was used in the lower mid-range phone of the same brand, named Realme 2. It has the same 2 MP depth sensor like its Pro version. Now, if Realme 2 had a 2 MP depth sensor, shouldn't Realme attach a better depth sensor in its Pro version....I will leave the question upon you. Realme 2 had 4230 maH battery which was considered one of the best battery centric phones after launching. But the Pro version of it only has a 3500 maH battery capacity, which is just average nowadays. It can hardly survive a full day if you use for games or heavy multitasking. The other brands in this price segment are offering better batteries than this, some have 4000 or even 5000 maH battery capacities. Realme here had to add at least a 4000 maH battery which was recently used in Samsung's latest flagship, the Galaxy Note 9 also. Realme 2 Pro has definitely a good hardware support. But as it was a sub-brand of Oppo, it still contains the custom UI of Oppo phones, the Color OS. Now according to Oppo users this skin is quite laggy and over customised. Realme, after being an individual brand, could go for the stock Android UI but they kept the Color OS in them. Well this can be a fact for the stock Android lovers. Everyone knows the criticism Poco F1 faced after launching about its DRM L3 support. Well the Realme 2 Pro is another one we have in the sub 15,000 range. We can see the Asus Zenfone Max Pro M1 with the DRM L1 support starting from just 11k but this phone lacks it being 3000/- costlier. Now what is this issue? It's actually a certification smartphone needs to stream HD videos from any paid subscription apps like Amazon Prime or Netflix. You can stream up to 540p quality with the L3 support but need the L1 certification to stream in HD. So for those who like to watch online TV series or movies from these apps in HD, this will be a complete deal breaker. This is a point where everyone might not agree because every phone doesn't have the type c port or supports fast charging in that price segment. I also agree. But if we look closely, those phones which were launched before the ending of Q2 of 2018 only those came with the micro USB port and no fast charging support. But we recently got some phones near that price range from brands like Nokia and Motorola with both type c and fast charging support. Both of them were launched within August and September. And Realme 2 Pro is the latest among all of them. So it must have at least one of them, or both, being the latest launch. After all the drawbacks we concluded here, all are genuine and definite needs for many of the consumers. And after these drawbacks, if we look at the pros of the phone we have just 2 in the list, the processor and the notch. And if we try to remember, before the phone was launched the only leaks we had was the processor, dewdrop notch and the pricing bracket. It was definitely a strategy to get a hype over the phone so that fans can't find the drawbacks after the launch of the phone. It's now our responsibility to stop promoting this kind of product to the highest level. Some limited consumers who want only performance in their phones, this phone only matches their needs. Otherwise, this phone is definitely neither an all-rounder nor the upgrade that future smartphones need.